When I work with my clients to help them to uncover their purpose, I always have them think back to what they loved when they were a kid. As a child we have endless faith. We go from wanting to be a firefighter to an artist to even a princess and it's so easy to tap into the things that you love without worrying about any outside opinions. But as we grow older we are told what's realistic, what will make a good career and what success should look like. The more we consume those opinions, the more we let go of our childhood dreams. 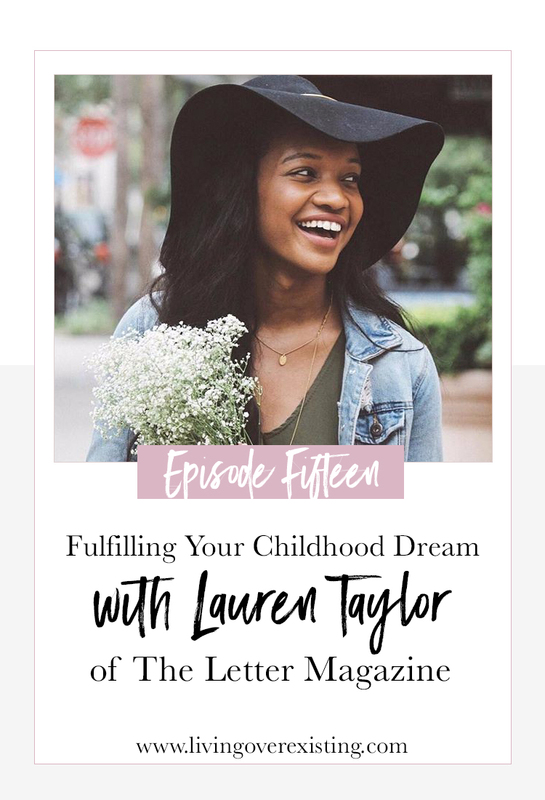 In this week's episode, I chat with Lauren Taylor, the founding editor in chief of The Letter Magazine. A print and online platform that focuses on inspiring everyday women. We talk about the purpose behind the magazine, how she has built an incredible dream and how she has brought her childhood dream of owning her own magazine to life. Definitely make sure that you listen to the entire episode because at the end Lauren shares the exact moment she knew that she had uncovered her purpose and it is POWERFUL!